It’s here! 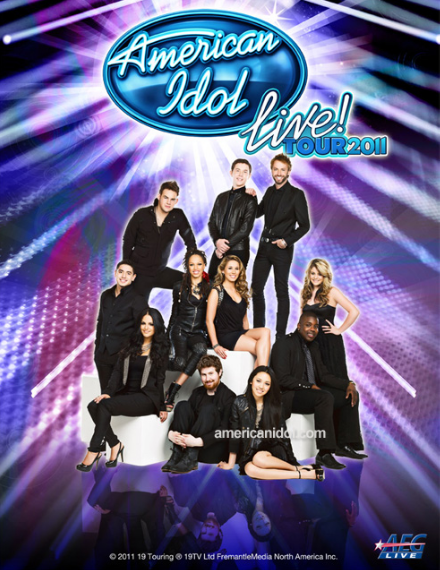 The American Idols LIVE! 2011 Tour is coming to a town near you this summer. See Season 10’s Top 11 perform at a town near you. Locations have been announced. All tickets go on public sale at 10 AM on May 13th, with the exception of Toronto, Canada, whose tickets go on sale at 12 PM on May 13th. Use the code AMERICAN beginning at 10am your local time on Wednesday, May 11. A spread of the Top 11 dancers on this week’s issue of Us Weekly. “Introducing the hottest hoofers on the Fox hit,” say the magazine. This feature validates the show’s ‘arrival’ to mainstream media. We don’t recall a SYTYCD article from celeb magazines before or maybe we haven’t been paying attention much. Here it is with a PDF file for better viewing. Results: Who got eliminated on So You Think You Can Dance 7? Check back here weekly to see who is eliminated until ultimately we get “America’s Favorite Dancer.” Results show are Thursdays at 9pm ET. Performances and voting nights are on Wednesdays, 8pm ET. July 22: no one is voted off!! They are eliminating two people next week!! Following Idol’s save?? What gives?! Another week, another injury. Another dancer eliminated due to injury!! Alex Wong is eliminated from the competition due to a lacerated Achilles tendon. He needs an operation and 3 months of rest. SYTYCD wants him to come back. Posted on June 17, 2010 August 13, 2010 Author adminCategories Results, So You Think You Can DanceTags Adechike Torbert, Alex Wong, Alexie Agdeppa, Ashley Galvan, Billy Bell, Cristina Santana, Jose "Full Deck" Ruiz, Kent Boyd, Lauren Froderman, Melinda Sullivan, Results, Season 7, So You Think You Can Dance, Top 11, who got eliminatedLeave a comment on Results: Who got eliminated on So You Think You Can Dance 7? A recent high school graduate, Lauren Froderman was born and raised in Phoenix, AZ. She has been dancing since she was 3 years old. At age 10, Froderman performed with the Phoenix Rockettes. Her life’s ambition is to perform on Broadway and become a school teacher. How old were you when you started dancing? Who is your favorite professional dancer? What has been your most memorable dance experience? Answer: So You Think You Can Dance(Vegas week). Other than that, dancing with my studio girls at Dance Motion. What style do you hope to pick out of the hat? Which style of dance are you afraid to get? Robert Roldan took his first Hip Hop class at age 11. After graduating from high school, he performed with the “Bad Boys of Dance” for a year and a half. In addition to dance, he enjoys singing, acting and fashion. Answer: I hope to pick Hip Hop or Contemporary. I’m nervous to pick Ballroom. Jose Ruiz is a self-taught B-Boy who has never had professional dance training. He describes his dance style as “smooth, flowing and explosive.” Ruiz has competed in international dance competitions and performed on cruise ships. He also enjoys yoga and plays several musical instruments. First performance dancing on his own style with all-stars Twitch, Comfort Fedoke and Domenic “D-Trix” Sandoval to a hip-hop routine choreographed by Tabitha and Napoleon. Music: “Din Daa Daa (District 78 Remix) by George Kranz. A native of Long Island, NY, Melinda Sullivan is this season’s sole tap dancer. She has been dancing since she was 2 years old, and has appeared in “Cats,” “High School Musical,” “High School Musical 2” and “Wonderland.” Sullivan is passionate about music and dance education, and is a fan of tap-dance legend Gregory Hines. Ashley Galvan began dancing at age 3. She appeared in 2009’s “Fame” and toured with the Broadway show “Wonderland.” In addition to dancing, Galvan loves swimming, shopping, movies and fast food. Answer: My first solo at the age of 4.